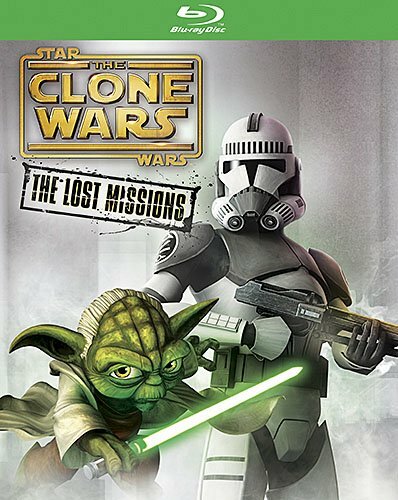 The sixth season of Star Wars: The Clone Wars animated series wasn't broadcast on television, but it has been released on Blu-ray, titled Star Wars: The Clone Wars: The Lost Missions . The outer slipcover of the case is pretty cool, as it has a metallic shine to it so that when held at the proper angle it looks like the Yoda's lightsaber is glowing. I thought that was a really nice touch. I've watched this show in high-def on television, but never in high-def on blu-ray, and it really does look amazing. The colors of the various aliens and alien words are so crisp and vivid. The sound is also pretty amazing. Being in 5.1 surround, you get to experience the sound of explosions blasting away behind you and blaster fire coming from all directions. Quite an immersive experience. There are thirteen episodes included in this release and five story arcs. Unfortunately, I didn't find most of these story arcs very interesting, and most did not feature Anakin Skywalker or Obi-wan Kenobi. The first story arc focuses on a clone trooper who murders a Jedi and then doesn't remember doing it. It ties in to the Star Wars Episode III by focusing on the implementation of Order 66 which we see in the film. The next story arc focuses on corruption in the bank that funds the republic and the separatists. Yay! Financial corruption! The next story arc finds Jar Jar Binks and Mace Windu traveling to a planet to investigate an ancient prophecy which is causing people to disappear. Yay! More Jar Jar! Next is a single episode and involves an investigation into the death of Jedi Master Sifo-Dyas. The final story arc I found to be the most interesting. It involved Yoda hearing the deceased master Qui-Gon Jinn telling him that he must learn how to project his consciousness after death. It's how he and Obi-wan are able to show up as ghost in the original trilogy films. So that was kinda interesting, but still not nearly as good as episodes in previous seasons. For extra features, there is a behind the scenes featurette that is about 15 minutes long. It focuses on the entire series, not just the episodes in this release. There are also four unfinished story arcs shown in storyboard format that shows what could have also wound up in season six.